I love Febreze ONE Bamboo. It has a light scent that is not over powering like a lot of air fresheners. It does not come out sticky and wet. It kills odors instead of just masking. I loved it in my bedroom and then was amazed with it in the bathroom. The sprayer is the most amazing part. Instead of a a pump sprayer you just squeeze it once and it sprays almost like a can sprays. I also love that one spray puts just enough out, so that there is no waste. 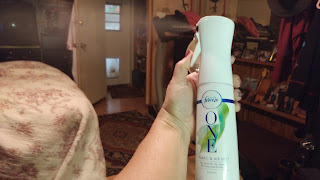 This bottle lasts longer then any other spray fresheners I have used. It works well for pet odors too.